Introduction: Recurrent laryngeal nerve palsy is a major obstacle in thyroid surgery. One promising way to ensure the integrity of the recurrent laryngeal nerve is to identify the nerve always. In endoscopic thyroidectomy, endoscopic magnified view allows us to identify the recurrent laryngeal nerve clearly. However, we should know that the finding of branches of the recurrent laryngeal nerve is quite frequent. Therefore, we investigate the frequency of branches of the nerve and how to minimize complications of nerve palsy. Surgical technique of finding the recurrent laryngeal nerve: The lower pole of the thyroid gland was drawn upward and dissected from the adipose tissue and cervical thymic tissue to avoid injuring the inferior parathyroid gland. The recurrent laryngeal nerve was identified between the trachea and the carotid artery. Results: Between April 2008 and September 2009, endoscopic thyroidectomy by the axillary approach was performed in 20 cases. Among them, we found 11 cases (55%) of branches of the recurrent laryngeal nerve. In two cases, we barely escape the chance of iatrogenic damage to the nerve. Large thyroid tumor, especially which grows on the posterior side, may dislodge the recurrent laryngeal nerve anteriorly when the branch of the recurrent nerve was the first to find. In this instance, it is strongly recommended to initially identify the nerve on its upper segment, through the dissection of the superior thyroid pole. 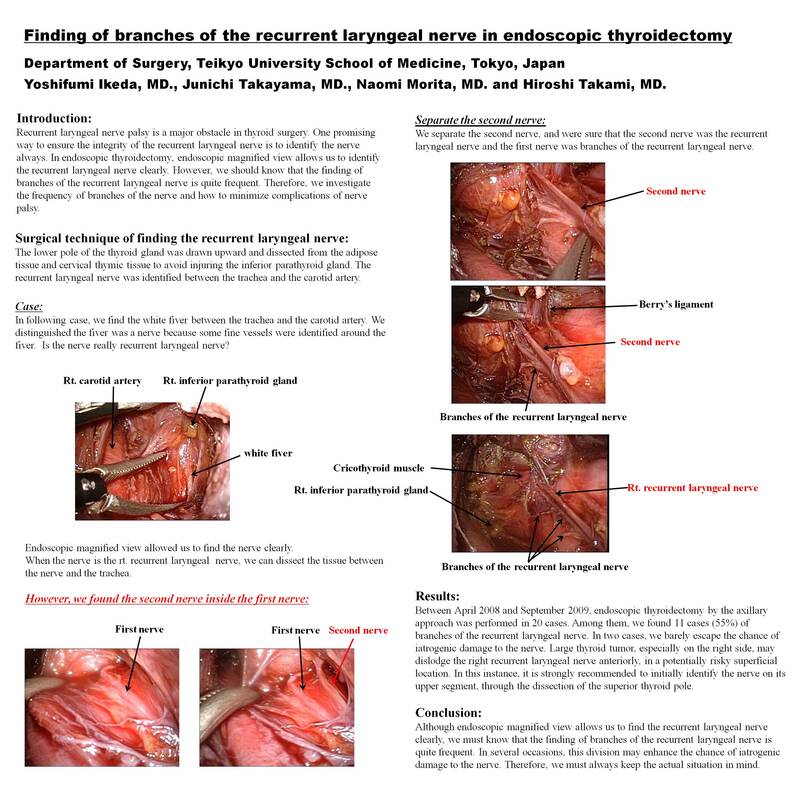 Conclusion: Although endoscopic magnified view allows us to find the recurrent laryngeal nerve clearly, we must know that the finding of branches of the recurrent laryngeal nerve is quite frequent. In several occasions, this division may enhance the chance of iatrogenic damage to the nerve. Therefore, we must always keep the actual situation in mind.